Essentially all stainless steel braided flexible hoses are a stainless steel braided sheath over an inner tube, usually made of highly durable EDPM rubber. The water pressure forces the EDPM rubber inner tubing to expand against the braiding to avoid any uneven stress pressure and preventing further expansion. If the inner tube liner ruptures and starts to leak the braided stainless steel is also unlikely to rupture at the same time. Usually, water will just leak through the braided stainless steel initially which will result in either rust spots, water leaking or ultimately if the warning signs go unseen a burst hose with the resultant flooding. Preventative maintenance is always the most positive way to prevent plumbing emergencies which is why Whywait Plumbing Service Partners receive annual testing of stainless steel flexible hose tap connectors where we identify the location and condition of all flexible tap or hose connections in your home used on your sink, vanity and toilet cisterns to ensure you have no potential bursts lurking in your kitchen or bathroom. 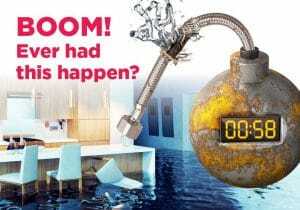 Regular inspections are a key component in minimising the risk of a flooded house from a burst flexible hose and regardless our recommendation is to replace them every 3-5 years as part of a proactive preventative maintenance plan. What Plumbing Is Needed In An Outdoor Kitchen? What plumbing is needed in an outdoor kitchen is a question that we are getting asked more frequently at Whywait Plumbing. To be honest an outdoor kitchen is exactly as the name says – a kitchen built in an outdoor living area so plumbing needs replicate those of inside your home. As restaurants have increasingly focused on alfresco dining this has now flowed through to our homes. Landscaping design is now all about creating an elaborate outdoor entertaining area complete with alfresco dining where meals are served from an outdoor kitchen. From a plumbing perspective many of these appliances and fixtures need to be connected to water reticulation, sewer drains and gas reticulation. Ideally your outdoor kitchen should be located with easy access to your house to enable easy connection to existing water, drainage and gas lines. Building an outdoor kitchen without easy access to these existing connections will mean that you have to install extra services lines which will blow your budget costs upwards. In an ideal world you should plan for your outdoor kitchen when building a new home so that you can ensure that the water, drainage and gas pipes are installed before the landscaping is undertaken. It is easy to plan ahead for the possibility that you may install an outdoor kitchen in the future even if your original design doesn’t include one by installing live capped off water connections, drainage connections and gas connections outside for potential use in future. When you are building a new home the cost to install live capped off connections is usually under a $1000 compared to upwards of $10000 to install new connections at a later date.